Today, as promised, I present to you a truly great battle: doughnuts vs. Pop Tarts. (Although, I must admit, those are Pop Tart impostors. They’re actually Harris Teeter’s Frosted Strawberry Toaster Pastries). It’s clear to see that the doughnuts make a bulkier tower. 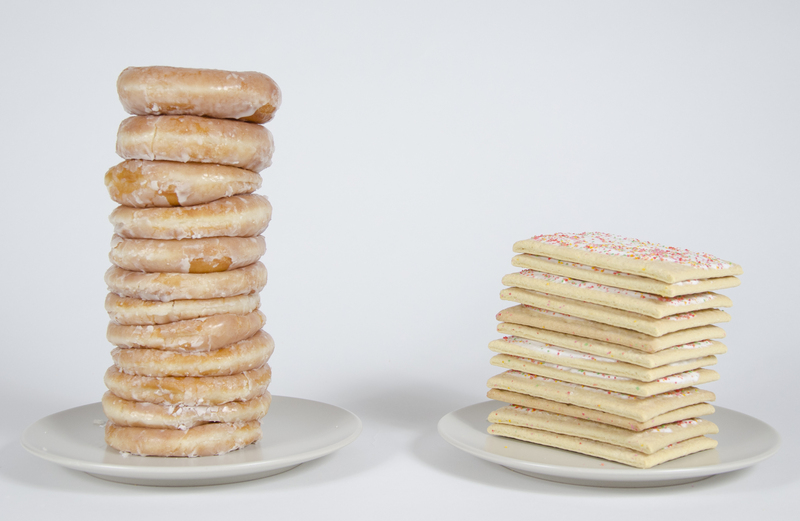 However, the Pop Tart Tower tips the calorie scale at 2,400. That’s 120 more calories than the doughnuts. According to the packaging, however, the Pop Tarts “provide 7 vitamins & minerals.” If you eat every single one of them, you’ll get 120% of your daily supply of iron. I wouldn’t want my iron any other way.